The Ashton Territorials Website Copyright © All Rights Reserved. Music on the Homepage: Requiem For A Soldier. WELCOME TO THE ASHTON TERRITORIALS, the 9th BATTALION of the MANCHESTER REGIMENT DURING WWI. THE ASHTON PALS - A BAND OF BROTHERS. "We few, we happy few, we band of brothers; For he today that sheds his blood with me shall be my brother". (William Shakespears St Crispins Day Speech, from Henry V). Are you looking for a Soldier who served in the 9th Battalion? Click on the Search below, type in his name, or service number, or his address. 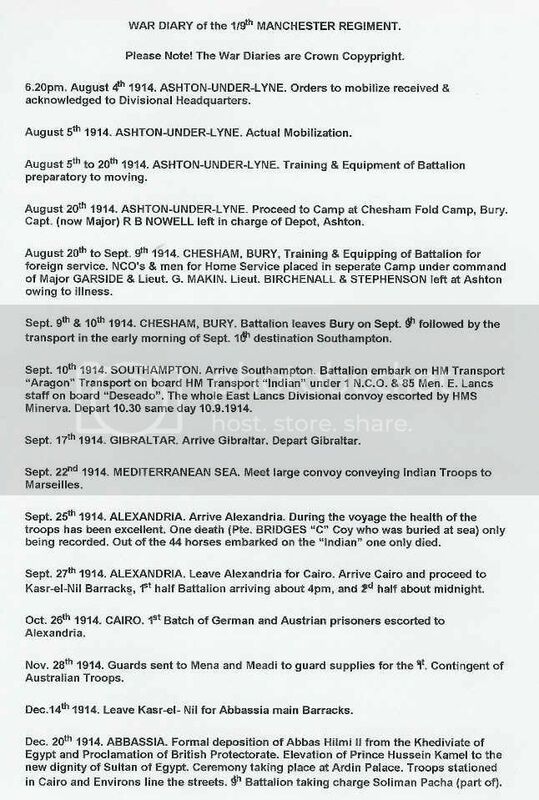 CLICK HERE TO VIEW THE WAR DIARY. Click BACK in your browser to return to this website. At the outbreak of WWI on August 4th 1914, the Ashton Territorials were only a Home Defence Battalion. Lord Kitchener announced that the Territorial Force could volunteer to serve over seas, and this news appears to have been met with some excitement from the Ashton Battalion whose members were keen to be part of Britains fighting force. Published in the Reporter Saturday 8th August 1914. The orders for the general mobilisation came on Tuesday night (August 4th), and for the next day or two volunteers were pouring into the Ashton Barracks. The Territorials have been embodied, and are called up for the first time in their history. They have responded to the country's call, as there are over 900 men and 28 officers, in command of Lieut. Colonel D.H. WADE, and there have been few rejections on account of unfitness and of health. This week over one hundred recruits have joined. When the order to mobilise was received on Tuesday at the headquarters of the 9th Battalion Manchester Regiment, Territorials, the permanent staff at the Armoury, Old Street, was kept very busy. They were at their posts nearly all night on Tuesday in order to cope with the urgent requirements of the situation. Battalion orders were issued, and the rank and file of the battalion were required to fall-in at the Armoury at 9am on Wednesday morning. At that hour there were about 900 officers, non-commissioned officers, and men on parade, with their full active service equipment, also the brass and bugle bands of the battalion. The roll call was taken, after which instructions were given to the men as to the procedure pending the receipt of further orders from headquarters. They were informed that in the meantime they would be allowed to proceed to their own homes, and to report themselves in drill order at the Armoury each evening at 6.30pm and each morning at 8.30am. "Every man should be present. There are no ifs and buts about it - you must. You are soldiers, remember, under military law, therefore let us be soldiers. We don't want to play at it," remarked the Commanding Officer, Lieut. Col. D.H.WADE, in addressing the men. He exhorted every man to pay attention to the officers and non-commissioned officers. Published in the Reporter 8th August 1914. Lieut. Col. D.H. WADE, who has the honour of commanding the Ashton Territorials at the first mobilisation in their history, has seen varied and extensive service in Volunteer and Territorial forces. During the time he has been colonel, since the retirement of Colonel C.R. WAINWRIGHT T.D., he has gained the highest esteem both of the staff and the rank and file, by his enthusiasm, his thoroughness, and his geniality. Lieut. Col. WADE, in his youth, left Oldham for Singapore, where he fulfilled the duties of a Government appointment, and served three years there as a private in the Volunteer Artillery. On his return he served two years as private and NCO in the Cheshire and Caernarvonshire Artillery Volunteers. He joined the old 3rd (Ashton), Battalion Manchester Regiment as Second Lieutenant in 1900. He took the leading part in the formation and equipment of the Cycle Company, which he commanded until the Company was disbanded in 1906. After the formation of the Territorials he took command of G Company, and became Captain on July 13th 1901. On the retirement of the late Major POWNELL, he was promoted to the rank of Major. He has passed his examinations with distinction, having qualified in musketry and mounted infantry. Col. WADE'S son, Mr. JACK WADE, now holds a commission as Lieutenant in the same corps. MAJOR AND QUARTERMASTER M. H. CONNERY. Major MICHAEL HENRY CONNERY, the quartermaster of the 9th Battalion, is recognised in the service as one of the finest quartermasters in the British Army. His work during the past week has been simply beyond description and praise. He is a bluff, hearty, ready-witted Irishman, who was born whilst his father was serving in the old 96th Regiment (which afterwards became the Manchester Regiment) at Dublin, so that he is in every sense a child of the Army. When he was 13 years of age he enlisted in 1869 at Colchester, and rose from the ranks to quartermaster, and finally obtained his commission in 1897. In 1902 he was elevated to the rank of captain for distinguished service in the field, and in July 1912, he was promoted to the rank of Major. In April 1909, he was appointed quartermaster of the Ashton Territorials, and has made himself immensely popular. He excels in organisation, and remembering that an army fights on its stomach. Major CONNERY is undoubtedly one of the essentials of the Army. If he has charge of the commissariat then things are all right. In the Boer War Major CONNERY had the distinction of being mentioned in the dispatches. Published in the Reporter 22nd August 1914. The Ashton Battalion Territorials on Thursday, the sixteenth day of their mobilisation, answered the signal to "Fall-In" at the Armoury at four o'clock, and every able-bodied man was at his post. There were only four on the sick list, two of whom were officers, Lieutenant STEPHENSON, being confined to bed through influenza, and Lieutenant BIRCHENALL was stated to be medically unfit to leave at present. After breakfast had been partaken of a full day's rations were served out to each man, consisting of 1½lbs of beef, 1¼lb. bread, or 1lb. biscuits, vegetables, tea, etc. In addition each man carried his rifle and kit, weighing altogether about 30lbs. The men were all well shod with the Regulation Army boots. "They're going at last," were the words that were heard from the crowd assembled outside the Armoury. At last, Colonel WADE appeared, mounted on a beautiful chestnut, at the head of his men. He was accompanied by Major GARSIDE, also mounted. The Band struck up a lively air - "The Way the Wind Blows," and the men stepped out briskly, and marched along Old Street and turned the corner of Oldham Road, en route for Bury. Immediately after the bulk of rank and file came the machine gun section, with their two wicked looking Maxims, immediately followed by the Red Cross Van. The departure of the Ashton Territorials took place soon after five o'clock in the morning, but by that time many hundreds of residents had assembled round the Armoury and along the route of the march out of the town to bid them "Good-bye" and "Good Luck". The battalion marched the whole route to Bury, a distance of 15 miles, and arrived in camp at about 11, rather tired and dusty, but full of lively enthusiasm. The weather was fine, and not too hot. Bury is the divisional headquarters of the East Lancashire Infantry Brigade, which includes, in addition to the 9th (Ashton) Battalion Manchester Regiment, the 4th East Lancashires, from Blackburn, Darwen and Clitheroe; 5th East Lancashires, from Burnley, Accrington, Haslingden, Baccup, Padiham and Ramsbottom; 10th Manchesters from Oldham, three sections Signal Company, Headquarters Company of Engineers, Lancashire Brigade Company A.S.C., Transport and Supply, and the 2nd Field Ambulance. The total number of Territorials in camp is about 5000. Ashton has the proud distinction of contributing to the citizen army probably the two youngest Territorials in the East Lancashire Division, if not in the North of England. Masters ALFRED and JAMES BOOCOCK, whose photograph appears above, are the sons of Quartermaster-Sergeant BOOCOCK, one of the oldest Territorials in the district, who has attended the annual encampments of the old Ashton Volunteers and the Territorials over 30 years in succession. As two worthy sons of the Empire, they are endeavouring to follow in their father's footsteps, and all three have loyally placed their services at the disposal of the military authorities, and offered to serve their country in whatever capacity required during the war. JAMES, the elder of the two boys, celebrated his 16th year last Tuesday, and the other brother will be 15 years of age in October next. They have served as drummers in the Ashton Territorials, and at the four last annual encampments, in which they have taken part; they have proved their usefulness and zeal for the work. They have been attached to the battalion during the past four years, and a few days after the mobilisation they formally joined the battalion. By the rank and file they have been regarded as the mascots of the battalion. NEWS FROM THE ASHTON REPORTER REPRESENTATIVE AT BURY WHO IS WITH THE 9TH BATTALION. Wednesday 2nd September, Chesham Fold Camp, Bury. This morning, in accordance with Lord Kitcheners letter and his speech to the House of Lords, the 9th Battalion was visited by the Brigadier-General, Colonel PRENDERGAST, commanding the East Lancashire Infantry Brigade. The General had the men before him, and laid the situation of the English Army in the present crisis before them. He also had served under Kitchener, he was proud to say, and hoped to serve again. He reminded the men that England and English trade was in grave peril from her foe, and that as in former times he hoped that Englishmen would step in and take up the cause of their land. He knew the feelings of Lancashire. He had had the honour of commanding a Lancashire Battalion out in South Africa, and he had been, and was still very proud of that fact. Often had he heard it said that the men of Lancashire were the best fighters and the bravest soldiers, and he looked to these men of the 9th to prove that the martial spirit of the county was not yet dead. He asked the whole Battalion to volunteer as a whole for any service they were asked to do. He promised them their own officers and companies, and asked them to loyally represent their dearly loved Company and patriotic town of Ashton in this cruel but necessary war. After the departure of the General, Colonel WADE, the commanding officer, called out the officers, and after conferring with them for a few moments spoke to the men. "Men," he said, "be British; reason it out to yourselves, and for yourselves, but for God and your country's sake BE BRITISH." These firm words of the Colonel ought to go down to posterity in the annals of the Battalion. How the men cheered and cheered again! "Be British!" Volunteers were asked to slope arms if they would volunteer, and what a show of rifles there were. Judging by the appearance fully 70% of the men agreed to serve anywhere, and this reflects great credit on the Ashton men. REPORTER REPRESENTATIVE: - On Saturday Colonel WADE addressed the men. He wanted to know what they were prepared to do if they were asked to go abroad to join the troops already in Belgium. "Were they British enough?" he asked, "to volunteer to go as a separate unit, if not to Belgium then to any place Lord Kitchener might desire them to go?" It was indicated that practically the whole of the officers had volunteered, and that they all should go in the Companies to which they had always belonged. The men debated amongst themselves for a time, and finally those who volunteered were separated from the others, whose names were taken by the Company commanders. An order came down from the Brigade headquarters that the home service men should have a separate camp from those who had volunteered for Foreign Service. This was speedily arranged, and the home service men are encamped in some ten or eleven tents a little removed from the rest of the Battalion. About 25 officers and 834 men have given their names in for service anywhere. However, during the course of the night, many of the men who were removed from the rest of the Battalion changed their minds, and had rejoined their comrades in the tents for those who had volunteered to serve anywhere. 1914 : Middle row, second in from the right, Pte. 1872 HARRY OGDEN, to his left, sat along side him is Pte. 1845 FRED FINUCANE. Published in the Reporter Saturday 5th September 1914. BATTALION TO GO TO EGYPT. On Wednesday, a "Reporter" representative paid a visit to Bury. News had reached Ashton in the morning that the East Lancashire Division (Territorials), which includes the Ashton Battalion, had received orders that they were to leave for Egypt that night. The news was only partially true. The men are, it is stated, going to Egypt, but their departure is fixed for Sunday. It appears that on Wednesday morning a divisional conference was held, as a result of which the 9th Manchesters are under orders to proceed to Egypt. It is expected that they will strike camp on Sunday, and will proceed to Southampton on the Monday. Preparations are being made for departure.